Enhance your patio or garden with elegant, vertical style using this Panacea Rubbed Bronze Rustica Italia Pot Trellis with Base. This ornate piece meshes a classic, narrow trellis with a plant trivet, for a beautiful look virtually anywhere. A gently arched top creates a timeless trellis shape, while a wealth of scrolls sits below and above this curve for added style. Square, steel rods form both a frame and an interior grid, supporting these flourishes as well as plant tendrils. 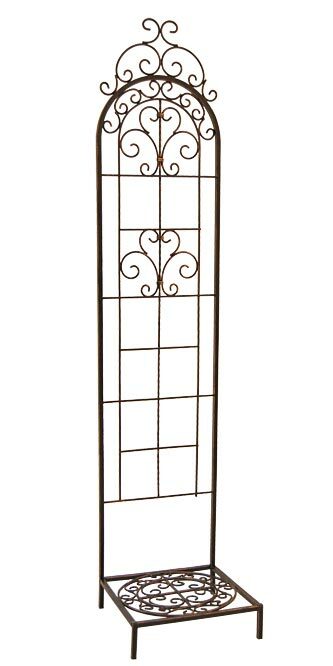 This trellis attaches easily to the included, 13" square base, and the rubbed bronze color throughout the unit offers an aged effect. A 12" diameter circle rests inside the square base, its scrolls echoing those of the trellis. This disc supports a pot with an 11.5" diameter or smaller base, and 3" tall legs elevate the item from the ground. The steel body creates a durable accent, and its convenient design makes it simple to place on a level surface. Elevate the style in your yard or on your deck with this Rubbed Bronze Rustica Italia Pot Trellis with Base. Some assembly required.